KENNY SHIELS claims 'at least one' of his Derry City players has been approached by clubs in the Irish League as he bids him to step up contract talks with his squad this week. The Derry City boss stressed the difficulties the Brandywell club faces as a 'next door neighbour of the Irish League' with clubs circling around his best players who are out of contract after Friday night's final League of Ireland fixture against St Patrick's Athletic at Richmond Park. Those players, including Republic of Ireland U21 capped, Rory Hale and Northern Ireland U21 international, Jamie McDonagh who this week spoke out about the club's apparent reluctance to begin negotiations, have been free to talk to other clubs during the final six months of their current deals. Given the fact most of the Irish League clubs are part-time, Shiels says it's difficult to compete with offers from the Danske Bank Premiership with players free to find another source of income in their spare time and guarantee a wage throughout the whole year. Shiels claimed last week that he has identified potential new additions for his 2019 squad but won't be able to secure their signatures until next summer, midway through the Airtricity League campaign, when the Irish League season concludes. "We're about developing players and selling them on. The Irish League is certainly going after a lot of our players," he claimed. "You've probably heard the rumour today that another player may be going to the Irish League from our club. Obviously I can't say much about it but there's rumours that one player has been poached to go to the Irish League - at least one and possibly two. Derry City boss, Kenny Shiels hopes players are encouraged to sign for the club despite interest from Irish League clubs. "It's something which is hard to deal with because of the the way the leagues are at the moment but I'm doing everything I can to get a good team on the pitch and you can see the potential of the young players we have. There must've been eight or nine of them tonight (against Bray). "It's really hard being a next door neighbour of the Irish League - it's hard. You can understand the problems we have encouraging players to come to play for Derry City at this moment. But hopefully the style of football that we're playing - we're close to 80 goals scored this season. There's a lot conceded as well but the players are playing with freedom and we'll develop players and sell them on and I hope to get another one away next year." Derry fell to an alarming 19th league defeat of the season and a second at the Carlilse Grounds in 2018 - the home of relegated Bray Wanderers on Monday night. And for the first time under Shiels there was no representative from Derry city in the starting XI which reinforces his concerns about attracting players from the maiden city to the club. "It's not by accident and it's not by design, it just happened. Last year there was something like 13 or 14 of the 18 was all from Derry and I've tried everything. 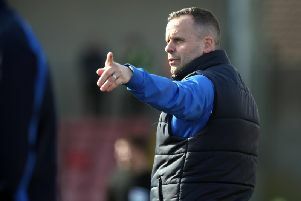 "Every club I've been at I've tried to play local players - good, young potentially quality players and I'm struggling now to get the Derry players and I'm not blaming anyone for that it's the culture and the way it has gone."